It's been a few years since I finished my formal education. I've been getting the itch to take a few more structured training courses, but don't have the desire to commit to another full university degree. Fortunately, there are a lot of places online that now offer training and college courses (both free and paid). I'll be picking out a few and going through them as my free time permits. I'll be sharing my thoughts on the courses in a series of posts with a review of the course and, if available, a link to show what I produced during the course. 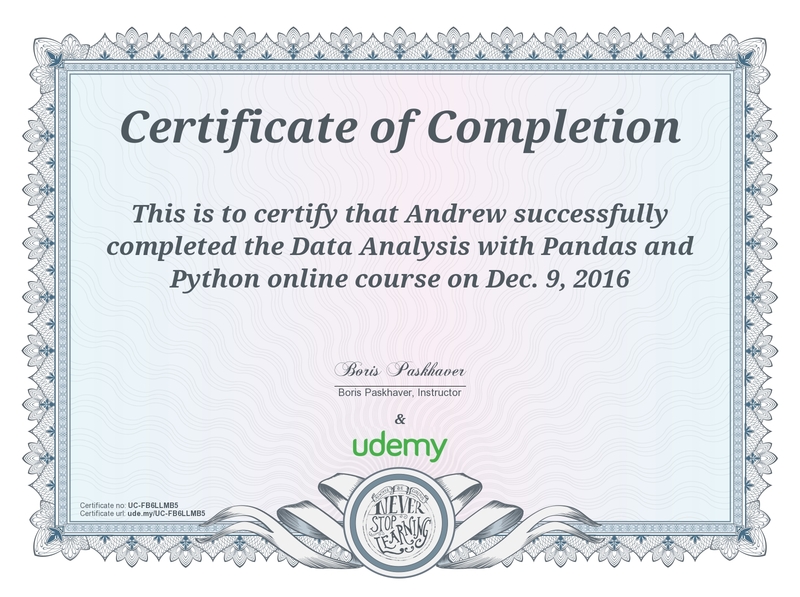 I recently completed Data Analysis with Pandas by Boris Paskhaver on Udemy. I use pandas both at work and in personal projects and constantly find new things the library can do. This course is billed as a 19 hour course spanning 173 lectures. The curriculum looked like it covered both basics and topics I was less familiar with. It also helped that the instructor was offering a coupon code on reddit to take the course for free. I decided to take the course. Spoiler: Even if this wasn't free, this class was worth the price. It covered a large part of pandas and did so in a way that didn't make me tune out the instructor, even after 19 hours. The course starts a bit slow with your basic "How to install" tutorials. The entire course is done in a series of Jupyter Notebooks and, obviously, requires that you have Python (the instructor uses 3.5), pandas and a few other modules installed before we get to the good stuff. The instructor uses OS X during all lectures, but that has no effect on how things are communicated to the student. Everything is done in the Jupyter Notebooks or at a conda prompt. This works the same across all major operating systems. The only reason I felt this was slow was because I already had all of the requirements installed due to using the library before. I understand the need for this lesson, though, and can't hold it against the instructor for needing to include this. One thing that I liked about the introduction was that the instructor provided a series of CSV files we'd use throughout the rest of the lessons. These CSVs were varied in size and composition. I thought this was a great way to keep everyone on the same page. I've seen a lot of tutorials on pandas around the internet and most of them depend on generating random data. By providing everyone with a set of CSVs it is much easier to focus on specific aspects of the data and how certain functions work. The course really begins in Section 2 which is on the pandas Series object. It covers what a series is, various methods of creating one, and then goes over the various methods and attributes you can use on a series object. The module covers 21 lessons and lays the foundation for the entire pandas library. Section 3, 4, and 5 cover DataFrames. These sections cover 41 lessons. DataFrames are the heart of the pandas library. This is the object you'll use most of the time, which explains the number of lessons that focus on DataFrames. These lessons cover everything from selecting a series (column) in a data frame, adding a new column, dropping null values and sorting values. More advanced topics include various ways of filtering a dataframe to only the data you are interested in, applying a function to all values and working with either index labels or index positions. These modules are the heart of the entire course. Sections 6 and 10 deal with text data and datetime data. One complaint I had about these two sections was that they were separated so much. Both types of data need to be operated on the same way in pandas. Namely, you have to add either .str or .dt when calling a string or datetime function. I also think that datetimes are important enough and used frequently enough that getting a lesson in on how to properly use them early would make more sense. That complaint aside, both sections cover their content well. There isn't anything ground breaking here, especially if you've done any sort of work with either strings or dates in Python. The functions introduced all work as you'd expect based on that experience. The DateTime section also provides information on how to work with date offsets and time deltas. Adding and subtracting days/weeks/months is always important and the lessons cover how to do so pretty well. Sections 7, 8 and 9 cover aspects of pandas that many will use as well. These cover ways to join and group multiple data sets into a single data frame and the benefits of each method. MultiIndexes are not something I've used a lot, but after these 14 lessons I have already thought of ways I can improve my code at work to utilize these. Section 11 covers a topic that was brand new to me: Panels. I have never used them or heard of them. A series is a 1D data set, a dataframe is a 2D data set and a panel is a 3D data set. It is a group of dataframes. The instructor explained this concept very clearly and worked through multiple examples of how to build and use a panel. In this lesson, the panel we utilized was created by calling Google Finance for multiple companies. However, the panel that was returned was not formatted the way I expected and it bothered me for several of the lessons. At first, this was mentioned by the instructor in passing, and then seemed to be ignored. However, toward the end of the section, the course covered ways of reforming the panel to be in a different format. Sections 12 and 13 covered the portions of pandas that my users see at work. The end result of data manipulation. I produce visuals or excel documents and they are happy. The lessons cover how to export to CSVs and Excel (you need an ExcelWriter). It also covers the four most common visualizations I produce at my job - line charts, bar charts, pie charts and histograms. Outside of the scope of this course, but something I'll look into, is what else matplotlib can do. We did very little to customize our plots and I know that the library can do so much more. The final section covers a few of the miscellaneous options pandas has. There isn't anything exciting in this section and these 4 lessons are short. Placing them at the end is a decent spot for them, as it reminds you to go look at the documentation to see what other options are available (there are a ton). While I used a coupon code to take this course for free, I feel it was worth the listed price. The course covers 19 hours and 172 lessons. The may seem overwhelming at first, but the lessons are short, with most falling in the 4-7 minute range. There are a couple that reach the 10+ minute point, but they still held my attention the entire lesson. The instructor has the lessons structured in a way that allows you to pause and return at the start of any lesson without having to re-execute a long series of code. Most of the lessons are self contained, where a data set is either re-imported at the start of each lesson or a new one is introduced. The only Section that didn't seem to follow this pattern was the visualization module. That module kept using code from previous lessons. The section is less than an hour, but if you take a break you may need to rerun some of your code in this section. There are 4 "quizzes" in this course. If you've worked through the lessons with the instructor, the questions are very easy. I've now spent 19 hours (re)learning pandas and I feel that I've still just scratched the surface. I've learned a lot that I'll be taking back to my code, but throughout the course I still got the impression there is much more to pandas. « Third time's the charm?